Beehive Senior Care Provides Healthy, Happy and Quality Home Support, Personal Care, Housekeeping, Transportation, Live-In Care, Companionship and much more. We recognize that the decision surrounding personal care for a loved one can be one of the most difficult decisions many families face. Our motto states that we do more than just provide live-in home care for your loved one; we care about them. Caring friendships are crucial for seniors; such relationships promote longer, healthier lives. We are committed to providing affordable, quality live-in home care for the elderly—the care your loved one deserves. Please Contact Us today if you have any questions or to schedule a free, no obligation in-home assessment. Our Utah senior care service is more than just providing care, it's providing your loved one with friendships. 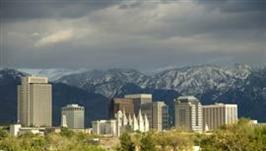 We are conveniently located throughout the Greater Wasatch Front area to best serve you and your loved ones. Beehive Senior Care provided the peace of mind I needed to enjoy my vacation. When do I need care? Family and friends are unable to provide necessary care. Activities of daily living become increasingly difficult. Infrequent bathing, unkempt appearance, and any other personal hygiene deficiency. Now hiring experienced Certified Nursing Assistants and Caregivers.